10 Deadly Ingredients In Your Toothpaste & Their Side Effects. 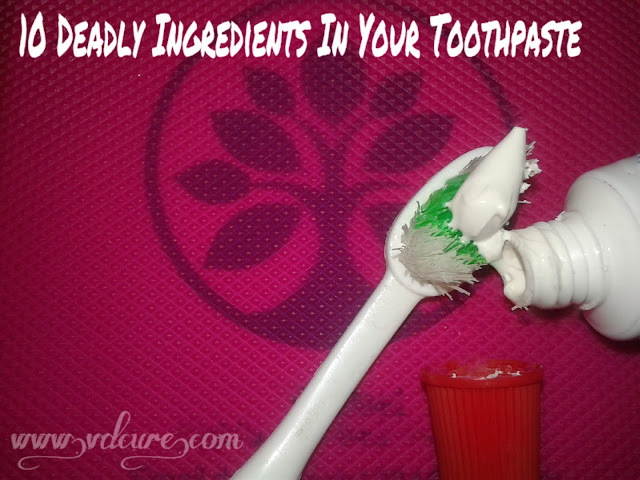 HomeOral Health10 Deadly Ingredients In Your Toothpaste & Their Side Effects. Toothpaste is a thing with which we start our daily activity. Twice a day brushing is considered the best policy to keep our teethes fit & fresh. In commercial TV advertisement companies always uses different techniques to attract more people towards their products. But the truth about their product is something different. Due to the professional causes your Dentist also tries to avoid a few of your queries. So get ready to know about the truth of your toothpaste. I hope the concept of brushing with your favorite toothpaste will be changed very soon. Ingredients Of Toothpastes & Their Side Effects. It is the main ingredient in rat poisoning products but unfortunately it is in our toothpaste. Up to 20 mg per day of elemental 20 mg per day fluoride is beneficial. Beyond 20 mg per day fluoride usually effects opposite to all beneficial profits. Beyond 20 mg per day fluoride usually weakens nervous system. For children it is a major concern as many child like to ingest the toothpaste very much. Symptoms like nausea, vomiting, diarrhea, dental and bone fluorosis can be seen in children. Muscle weakness and paralysis noticed in larger doses. It is generally used to remove oily residues and strains. Sodium lauryl sulfate is a popular ingredient of mouthwash that are available in market. Sodium lauryl sulfate is a popular ingredient skin care products, anti-aging wrinkle creams. Sodium lauryl sulfate is a popular ingredient floor leaners, detergents, car wash soap. Sodium lauryl sulfate is a popular ingredient of engine degreasers. It is harmful because it is easily absorbed and deposited in heart, liver, brain. Hydrated Silica prevents re-mineralisation of the teeth. Propylene Glycol causes damage to the kidneys. Triclosan creates problem in thyroid hormone secretion. Triclosan creates problem in estrogen secretion. These are derives from petroleum which means you are using crude oil. Also known as DEA which absorbs through mucus and remain in the body for a long time. Causes formation of fatty cells in all vital organs like heart, brain, liver, kidney etc. By increasing fatty tissue it generally increases he chances of heart attack. Sodium Monofluorophosphate is very potent skin irritant. Sodium Monofluorophosphate is very harmful for gastric mucosa as it irritates the GI tract. Sodium Monofluorophosphate is allergic to many people. Sodium Monofluorophosphate may cause hypersensitivity reaction. You might have seen it in the packets of electric products in a small white bag. The looks like small crystal balls or crystals. The are water soluble and alkaline in nature. Sodium Silicate is very corrosive in nature. Actually you need to put gloves before handling the solution of Sodium Silicate but unfortunately we are using it in our toothpaste. Sever contact with skin can cause third degree burn. It is allergic to many people. During Pregnancy toothpaste should be used with caution, toothpaste consists Fluoride which can be used up to 10 mg per day. Herbal Tooth Powder consists no such ingredients so they could be good choice. For Children under six year toothpaste is not suitable as they used to ingest the paste. For the people having gum bleeding or ulcerated mucosal lesion should avoid toothpaste. Lactating mothers should use with caution used with causation, toothpaste consists Fluoride which can be used up to 10 mg per day. Herbal Tooth Powder consists no such ingredients so they could be good choice. All those people who having any kind of allergy to these products. So how many of you are still wanting to continue your toothpaste? I will be happy to see your replies in the comment box. Being the smartest of all creatures we, the humans should be more conscious about our health, but the practicalities we are different. Due to commercialization, we are more addicted to smart products, without knowing their facts.. Many companies are selling their products by mixing natural ingredients with those above mentioned ingredients. Those toothpastes though advertising as a natural, but practically there are not such. The “Dantmanjan” or Herbal Tooth Powders comes with natural ingredients. There are many such powders available in the market. Such Ayurvedic products are free from side effects and beneficial for your gums, teeth and oral cavity. It is also mentionable that few herbal companies are also making toothpastes with natural elements. Always remember foaming is necessary for washing your dirty clothes, but not for your teethes. Go for the herbal products for safety and toxin free oral hygiene. Live with nature and cure with Ayurveda.